Capogna Flowers has a rich history in Essex County. The farm was founded in the early 1970’s by Sam and Vicky Capogna as a past time. Coming from Italy in 1954, both Sam and Vicky were accustomed to a farming way of life. 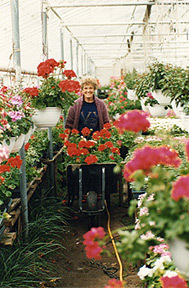 The initial intent was to open a part time bedding plant business for family and friends to share their passion for flowers. The six week flower season in May, quickly grew to a spring and summer long growing season. The Capogna’s also grew peaches, plums, pears, apples and melons on their eight acre farm, all while raising three children. Their hard work quickly filtered through to their children and grand children who all worked on the farm (some more than others). Eventually, Ann Capogna and son Andrew expanded the business to what it is today.